It’s that wonderful time of year again – the time of year when families gather together to spend quality time, while surrounded by wondrous red and green decorations, twinkling lights and jovial music. We understand the dire need of coffee during the holidays – all of those late nights spent gift wrapping and shopping. 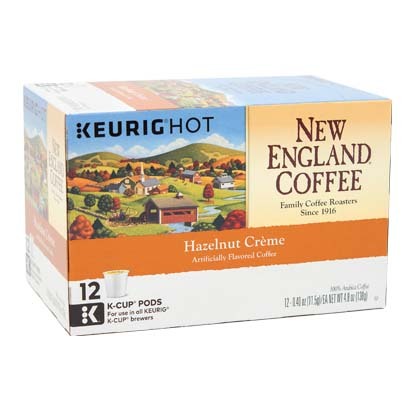 When you are done brewing your favorite New England Coffee k-cup pod, put that used cup to good use. Upcycle your cup into a Christmas decoration! We found some creative and eco-friendly crafts the whole family will enjoy. Here is a unique and musical way to recycle your k-cup pods. Poke a hole in the bottom (across from the hole already there), paint in festive colors and adorn with a pipe cleaner and something that jingles (such as a small bell). Enjoy a holiday treat, such as our French Vanilla single serve coffee, while you adorn your tree with these small, melodic ornaments. No need for paper supplies to make this snowflake ornament! Simple make cuts in your empty k-cup pods, spacing them about 3/4″ apart and making sure not to cut all the way through. Bend the strips down until the k-cup pod resembles a snowflake shape. Then, punch snowflake designs in various areas of the k-cup pod strips using a snowflake shaped paper punch. Glue a small photo in the center of the k-cup pod and voila, an elegant snowflake to adorn the tree! Now this may require the whole family or a group of friends to assemble but the finished product is worth the effort! This crafter used plastic cups but we suggest using your used k-cup pods. And because the instructions for this decoration are so simple, you can sip away on your own New England Breakfast Blend single serve coffee while building your snowman. Get crafty with this miniature Frosty hat, while enjoying a brew of Hazelnut Crème single serve coffee! Use a spray paint that works well on plastic – any color will work! – coat the k-cup pod in its entirety. Once dry, simply bedeck with small buttons, glitter or any other cute embellishments found around the home. Poke small holes into the bottom of the k-cup pod and loop the string through. Finally, hang your crafty ornament with pride upon your Christmas tree. Christmas is a time to give, so share these ideas with your fellow single serve coffee lovers! Happy Holidays!